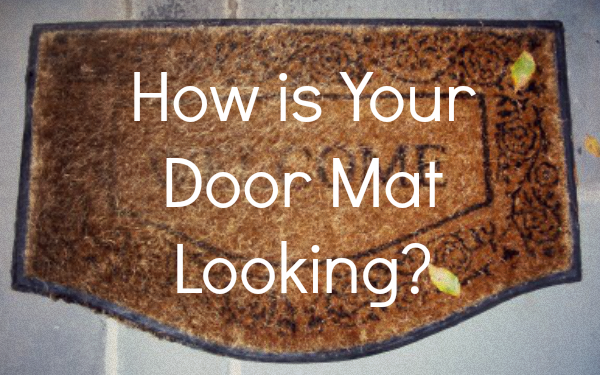 How is Your Door Mat Looking? It is was convicting for both of us. Do we “seek” to show hospitality? We give our tithe and put a few dollars in the offering every service and we have people over for coffee and Bible study once in a while. And those are good things, but do we actively seek out people, other than close friends and family, and invite them in? “Contribute to the needs of the saints”…what do you think that means? It means giving things away, like money, time, clothing, and food, for the sake of others in need. But Paul doesn’t stop at giving things away, he goes on and increases the demand on us, stretching us further, he says, “seek to show hospitality.” It is not only about giving things away, it is about drawing others in, not just for soup and buns between church services once in a while, but opening your hearts and your homes. We are to seek to do it without grumbling, and out of a heart of love. That is the biblical idea of hospitality, yet we tend to be of the mind that asks, “What’s in it for me?” or “What if …?” We are so often stifled in our hospitality by fear and greed. How many of us don’t ask people over because our home is “too messy?” I’ll admit it…but is that a valid reason? No. That is real life. Invite people in anyway, who cares about dishes in the sink and cheerios in the rug and toys on the floor? People matter. The mess doesn’t. Seeking to show hospitality is fundamental to being a Christian. As Christians we should all have well-worn welcome mats outside our front doors, from the streams of people coming and going. Ours is not nearly worn enough. How is your welcome mat looking? Previous Does God Punish the Christian’s Sin?